Hey-Diddle, A Fiddle And A Moon-Jumping Cow? NPR Moos Investigates For Cow Week, NPR's Wade Goodwyn blows the lid off of a children's nursery rhyme. He talks to Modern Farmer correspondent Tyler LeBlanc about whether a cow could jump over the moon. Yes, indeed, cows can leap. 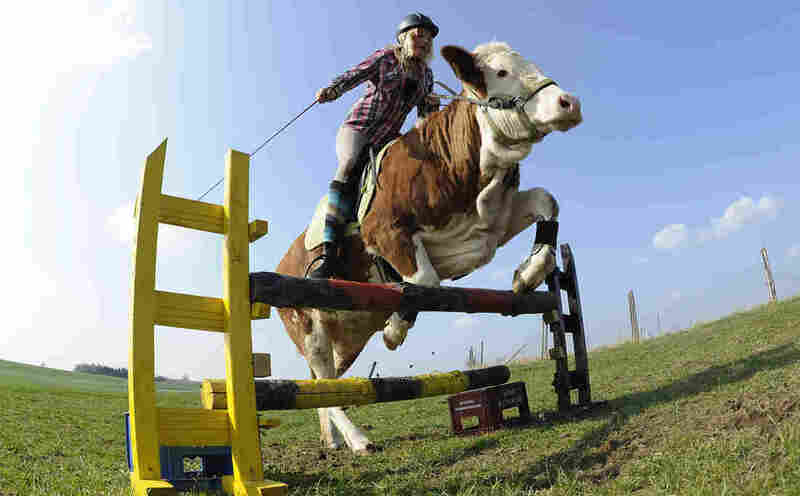 Here, Regina Mayer jumps with her cow Luna — yes, Luna — over a hurdle in southern Germany, in 2011. Can cows even jump? Yes, LeBlanc says. "When I first thought about it, I kind of just assumed cows couldn't jump at all — I don't know why, probably just because of their size," he says. "But strangely enough, they can jump. There's one incident I found from some English newspaper where a cow apparently jumped about six feet up onto the roof of a barn." Has a cow ever been around the moon? "Not unsurprisingly, they've never sent up a cow." Could a cow go around the moon? "They have sent a few animals to the moon. The Russians were the first to do it," he says. They sent turtles and worms up in a "biological payload" that traveled around the moon. "Unfortunately they all kind of burnt up on re-entry, but it's not hard to think that you could put a cow in there and send it to the moon, if you wanted to." Should a cow circle the moon? "I can't say I'm in favor," LeBlanc says — especially if it were to go the way Russia's animal voyage went. "It would be space barbecue."